"Crude Independence" was a body of light sculpture I built while an Athena fellow via Mark di Suvero, while a fellow I worked on a number of books, ideas, an interactive sculpture as well assisted Mark with his work and Socrates Sculpture Park artists. In 2005 I completed “Crude Independence” body of work (and folio) due to interests of Art Museum of South Texas museum baord the works are currently with Kiesendahl + Calhoun. "Crude Independence" focus is the challenge facing America in regards to its dependency on “crude energy”. Athena Fellowship (12) Sculptures, Drawings and (4) Books produced. “Crusafix” is a 7Crusafix’H x 5’W sculpture composed of a small monitor, pine beams, red ribbon, a photograph and a crushed silver crucifix. The sculpture is a statement based on the direct political opposition of our society’s religious organizations to the Aids epidemic and the ability of these religious organizations to negatively influence our society and politics. This led to insurmountable obstacles that blocked millions of Americans from receiving adequate help. In 1993 my half brother was diagnosed with aids he died in 2005. “Crusafix” was built for my brother and as a tribute to the church for everyone they suffocated. 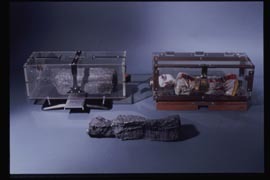 "Crusafix" was exhibited in Leslie Lohman Gallery | Article NYC in 1995. The “Electric shutter”, was 15’H x 18’ in D. “Electric shutter” was composed of four sections of steel, wood and shutters (stationary and loose) an electrical touch plate (attached atop the structure) and a modified floor waxer. “Electric shutter” once powered, a bell activated, the touch plate fed power thru the swing arm to a floor waxer (modified to follow the garden hose) pulled the swing arm into 360 rotation. 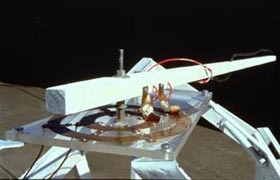 The waxer continued to circle the structure the rotation activated the suspended shutters to jitter. The “Rocking Red Window” was a 2.5’W x 6’L x 7’H viewer-participant resonant sound sculpture constructed of spring steel, an oak base, PVC plastic, 22 piano wires, 22 tuning pins, a mechanical swing arm, springs, two wooden windows and pre-fabricated hardware. When the viewer participant activated the swing arm the entire sculpture rocks as the swing arm plays the 22 steel strings. Detailed are the swing arm, pick and wires. 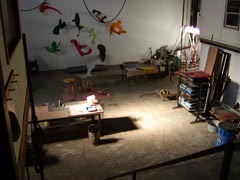 "Xylophone" was a 2’H x 5’ W x 8’ D 22-piece spring steel resonant sound sculpture. The 22 pieces of steel leaf spring (as used in car suspension) were set atop foam to allow for resonance individually secured by aircraft cable. The base structure below the foam was steel angle iron, oak and 1/8” cable. Once the viewer-participant struck the steel leaf spring, each would resonate a pure tone. When played together it sounded like a “layered matrix of church bells”. Playing the “Xylophone” sent resonant vibrations through the concrete floor and cinder black walls of the room where it was displayed. “Sound Sculpture 1” was a 7’H with a 2.5 trapezoidal ft. base. The sound sculpture was made of welded steel leaf spring (as used in car suspension) and supported by an oak and steel structure. The welded steel leaf spring structure suspended the ¾”H x 1¾”W thick granite triangle by a piano wire and tuning pin set in ash bolted to the top of the steel leaf spring structure. When the piano wire was plucked, a pure tone resonated through the entire structure. Putting pressure on the granite slab altered the pitch of the tone produced. When the wire is plucked sculpture resonates. “Sound Sculpture 2” was a 7’H with a 2.5 trapezoidal ft. base. The sound sculpture was made of welded steel leaf spring (as used in car suspension) and supported by an oak and steel structure. 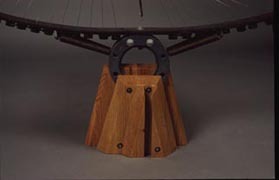 The welded steel leaf spring structure supported a by an oak and steel structure. The welded steel leaf spring structure suspended the 1”H x 4.5’ W x 6” D slate slab by 2 piano wires and 2 tuning pins set in 2 pieces of ash bolted to the top of the steel leaf spring structure. When the piano wire was plucked, a pure tone resonated through the entire structure. Putting pressure on the slate slab altered the tone. “Sound Sculpture 2” resonated twice as long as “Sound Sculpture 1”. When the wire is plucked sculpture resonates . "Metamorphosis of a Bread loaf" was a series of 3 bread loafs (1) original Colonial bread loaf and (2) aluminum casts of (2) Colonial bread loafs (1) taken off a new bread loaf and (1) taken off a six month old bread loaf. I set both original Colonial bread loafs in silicon resin sand molds and poured aluminum directly into the molds burning the bread loaf out. When shown together, the (3) sculptures are directly associated with the various mythologies, pomp and circumstance embedded in Catholicism and the ideology in Communion where bread used as a metaphor for the “body of Christ”. Rather the receiver is engaged in a purely mythological experience. The concept originally inspired by viewing a bone shard of “John the Baptist” encased in a box in Notre Damn, Paris.